So you’ve got a garage, a barn, a house, a storage unit, or all of the above overflowing with things you just couldn’t live without but now, for whatever reason, you’ve come to the conclusion it’s time to part with some of the “stuff”. Or maybe you are an enthusiastic “yardsaler” yourself and you have lots of things you think other people might like to buy. Or maybe you are a craftsman, or an artisan or maybe even somebody who just thinks setting up for the 127 Yard Sale would be a good idea. What do you need to know? Here are my top tips for first-time sellers. CAN I DO IT IN MY YARD? Yes, you can! That's the way the 127 Yard Sale started out, with the idea that people could set up a sale table or a farm wagon under a shade tree in their front yard and sell their junk stuff! People still participate that way every year. However, since hundreds of thousands of people began to make the 127 Yard Sale their summer vacation and it became "The World's Longest Yard Sale" selling from a front yard has become more difficult. The number of cars and people from literally around the world have made the original concept, though still quaint and good, a challenge for yardsalers. Few people have sufficient parking in their yards for more than a couple of cars, and driveways were never meant for two way traffic. So yardsalers began parking in ditches, along highways and trying to carry merchandise across busy roads. Not an ideal scenario. Besides, a lot more people want to participate who don’t live right on US 127, so some people began renting lots, farms and places big enough for vendors to set up. These locations where multiple vendors set up altogether are owned by Rental Space Providers, i.e. the property owners. If you don’t think you can handle the traffic, or if you have something to sell and don’t live right on US 127, you ought to think about renting a space from a Rental Space Provider. Some of these locations with multiple vendors are so large (25+ vendors) they are referred to as, Major Vendor Stops, and there's a lot of them! BUT I’VE NEVER DONE THAT. WHAT DO I NEED? Yardsalers don’t necessarily care much about fancy commercial tents and facilities. However, they do appreciate some organization and price tags! Early on when the 127 Yard Sale first began and it was a much smaller event most people didn't mind picking through boxes on the ground or looking at stuff piled up on a folding table. Some yardsalers still don't mind—it’s all a part of the image of “getting a deal”! But now that the 127 Yard Sale has become so huge, there's a lot of competition among vendors. Yardsalers only have 4 days to visit potentially thousands of vendors and most of them are not going to waste their time digging through boxes to find something they are looking for. It's highly recommended for vendors to display their items on tables or the ground, so at a glance, yardsalers can easily see what they're selling. Do you have glassware? A solid table is a good idea. Several depending upon how much you have. Do you have heavy items like tools or equipment? Use the ground. 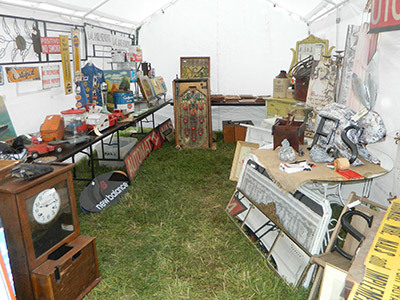 Antique furniture does well on the ground but may need an emergency cover in the event of rain, or heavy dew so be prepared for that. And some of what you need depends upon what you are going to do when the selling stops at dark. Choosing not to price your items is a gamble. Many vendors skip price tags with the hopes of encouraging negotiation. But vendors beware, a common complaint from yardsalers is the lack of price tags. So much so, that some yardsalers say they will completely skip over vendors who refuse to price their items. A lot of vendors treat the weekend as a camping trip. 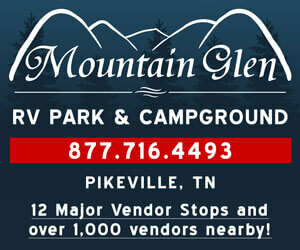 Some arrive in RV’s, or motor homes. Some put up tents. Whatever you might need to camp, you need to bring if you will be staying on your rental space. You also need to confirm there is space to camp on your rental space. If not, then you need to decide if you are going home at night, or to a motel. Hotel and motel arrangements should be made well in advance. Don’t forget, the buyers are traveling hundreds of miles and they need somewhere to stay too. Hotels and motels around the area fill up fast. Be prepared to deal with the public first and foremost. You will have thousands of people looking at your stuff, and every once in a while someone will express an interest or make an offer. Don’t get discouraged. Cracker Barrel only puts their stores near high traffic areas. Think of all the millions of people who drive by on the Interstate and don’t stop. You won’t make a sale to everybody, but over the course of three or four days, with high traffic, you will get your fair share and in the end, it will likely be profitable. Be prepared for long hours. Yardsalers typically are out and buying before the sun comes up and don’t stop until it’s down. In August that can easily mean 15 or 16 hours. Come prepared to be comfortable. Something for shade is a good idea. You will see everything from tarps on poles, to pop-up canopies to full-fledged professional pole and canvas selling tents. If this is your first time, get a little pop up, make sure you get the side walls (the sun isn’t always right over head) and get some comfortable chairs to sit in. Also, bring plenty of cold drinks, and food and PAPER TOWELS! You will get hot, and dusty and sweaty and you’ll be handling money and shaking hands and every time you turn around you will want to clean-up yourself, your table or your sellable items. And don’t forget to bring food for yourself, snacks and hand sanitizer. I promise, if you don’t, you will think of it before the end of the first day. Bring some way to make change and keep track of your sales. A little metal money box from an office supply store works well. Bring a pad of paper, and a couple of pens. Maybe some price tags with strings attached, a roll of duct tape and a little first aid kit will all come in handy. Dress for the weather. It might be cool in the morning and a thermos of coffee will taste good. By 2 pm it might be so hot you can’t breathe, and then a shower by 5 could make you chilled to the bone. Be a boy scout, BE PREPARED. Bringing a rain jacket or some rain gear might not be a bad idea. Nobody can predict the weather. I would highly suggest you get yourself a little headlamp at a sporting goods store. Flashlights are a must, but once you wear a headlamp you’ll wonder how you ever lived without one. You need to decide how you are going to take care of your stuff when night falls. Does it need to be covered? Are you going to put it in tubs with lids? Will dew, or rain hurt it? Are you worried about leaving things out all night if you are gone? Most reputable vendor spaces are safe for your stuff, but rain and dew are considerations. Inexpensive tarps are a good idea, but then, how do you hold them down? You can sit heavy things on them or get those big heavy spring gripper clips to hold tarps to tables, or use rope, or twine. You will need some tools, I promise. A knife, maybe a hammer, and an adjustable wrench; and if you don’t bring one, somebody will have one to borrow or have one for sale. But it seems like no matter what, a few hand tools always come in handy. Be prepared to have fun. If you go into the event with the mindset that you are going to meet a lot of fun people, get out and see all sorts of sights as buyers parade by, hear many interesting stories, learn things you didn't know and in the process get rid of some of your "stuff" and maybe even make some money, then you will have the time of your life. WHAT KIND OF STUFF WORKS WELL AND SELLS? Everything sells. Broken saws sell to guys making knife blades, old plastic toys sell to grandparents, candles sell, jewelry sells, antiques sell and you might even sell your tent and your tables or the vehicle you came in. But what kind of stuff works depends upon your ability to be prepared. A table full of scented candles without shade will not do well. Tools left out in the dew might look rusty and glassware that collects dust and dew might not appeal to buyers as well as the shiny ones that look clean. It’s all a matter of the three “P’s”: Price, Presentation and Product. Any reputable rental space provider will be engaged in making your stay profitable, safe and fun. If not, they won’t be in business very long. So yes, the whole experience can be a very rewarding, relaxing and enjoyable time to meet with lots of people, chat, learn about them, carry on conversations and make new friends. And it’s a great time to shop with your fellow vendors. So come on, get out there and SELL. You never know, it might be almost as much fun as buying!